Looking To Make A Career Move? 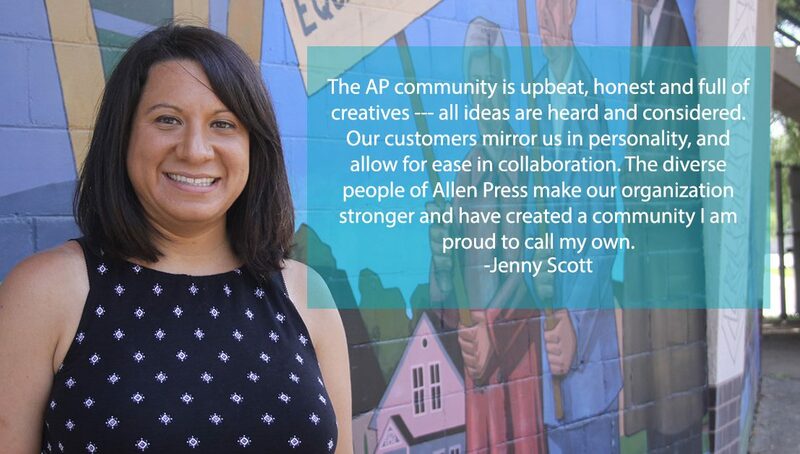 The strength and stability of Allen Press can be attributed to its people. We have grit, have fun, stay positive and are team players who get results. Allen Press prides itself on hiring growth-minded professionals who are willing to give some extra elbow grease to make our customers happy. Allen Press is dedicated to helping our employees be the best they can be, providing a dynamic environment for professional and personal growth. To excel at Allen Press, you don’t have to be ridiculously gifted or have an advanced degree. You just have to live our team values and be ridiculously committed to our mission and vision. We offer a competitive benefits package to all eligible full-time employees, including medical and health insurance, 401(k) savings plans, life/disability benefits, 11 paid holidays, paid vacations and more. In addition, we have a casual dress code so employees can spend more on their families and less on personal appearance. Other perks include career development, employee referral bonuses and company-sponsored events. Don’t see a current job opening that fits your unique skill set? Don’t worry, we’re always looking for talented professionals, at all levels, to join our growing team. Please apply using the General Opportunity position!